Male of Aphanius vladykovi from Boldaji, Iran. Female of A. vladykovi from Boldaji. Restricted to a small area of the Zagros mountain range in Chahārmahāl o Bakhtiyārī province, Iran. The type locality is close to the town of Boldaji in the upper Karun River basin and it has been recorded from nearby wetlands at Chagha Khur and Gandoman plus a few other localities in the region. Some aspects of its distribution remain unclear but it is thought to occur in the upper Khersan River within the Karun drainage as well as the upper Marun River, a tributary of the Karun that also arises in the Zagros. This species‘ natural waters lie over 2000m above sea level (the type locality is an artificially-dammed pool at 2380m). It inhabits slow-moving freshwater streams, pools and marshes which tend to have substrates of mud and pebbles with often quite turbid water. Aquatic plants such as Myriophyllum or Potamogeton species grow in areas where the fish can be found. Even for long-term maintenance a simple set-up will suffice. The most important factors are the provision of many broken lines of sight and a suitable medium in which the fish can deposit eggs. Female and subdominant male individuals must be offered the opportunity of respite from the aggressive alpha males during the spawning season so much of the available space can be filled with acrylic wool mops (use a fine grade if available), clumps of java moss or Ceratophyllum and ideally filamentous algae. There’s no need to add a substrate although inert sand or gravel can be added if you preferand filtration need not be too strong either. It is possible, and preferable, to maintain it outdoors all year round in many countries and it will show better colours and overall condition if exposed to at least a few hours of natural sunlight each day. Temperature: Active over a wide temperature range of 12 – 32 °C. Ideally it should be provided with a ‘winter’ period of several months during which it is maintained at temperatures towards the lower end of this range or it is likely to suffer both reduced fecundity and a shortened lifespan. pH: Readings taken from its habitats have varied between 6.2 – 8.5. Hardness: Although it is tolerant of slightly more acidic conditions than most Aphanius it does not appreciate soft water. Aim for somewhere within the range 179 – 357 ppm. 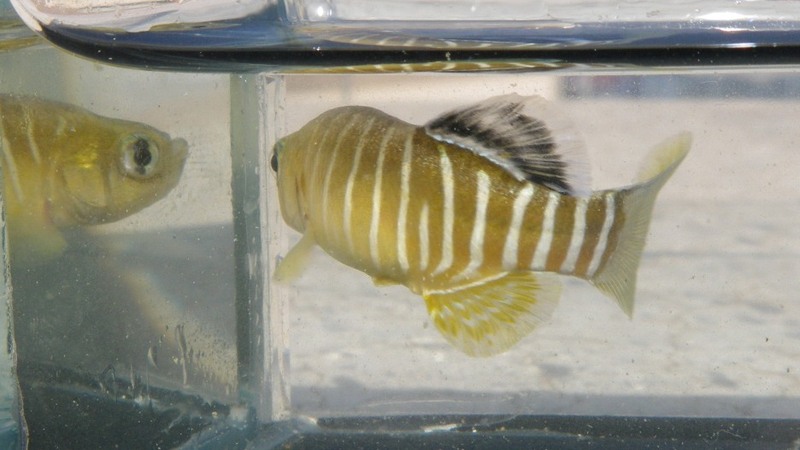 Its vigorous spawning behaviour makes A. vladykovi a poor choice for the community aquarium. Given its rarity in the hobby the emphasis should be on captive reproduction and we strongly recommend maintaining it alone. It should be kept in a group with a ratio of two or three females to each male being the ideal. Males are relatively peaceful towards one another compared with some congeners and it is found swimming in large schools in nature. As with all members of the genus sexual dimorphism is pronounced. Males exhibit a series of blue vertical bars in the rear portion of the body. The dorsal fin has a light blue marginal band and another thin band towards the base but is otherwise dark blue/black. The overall body colour is noticeably more yellowish than in females. Females are larger and much plainer possessing only a series of variable dark spots on the body and almost colourless finnage. Captive reproduction is not difficult if the tank or container is properly arranged and maintained (see ‘tank set-up’). It is a fractional spawner with females depositing eggs on a more-or-less continuous basis between the months of March and June in Iran. Males form temporary territories which they defend against rivals while attempting to entice females to spawn. 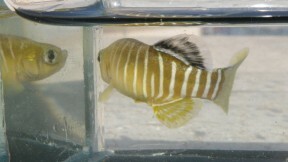 Dominant individuals will show more intense colouration. Eggs are released singly or in small batches and are attached to algae or other surfaces by means of small filaments. Aphanius typically eat their eggs/fry and the medium should therefore be checked on a daily basis during the spawning period. The Iranian Plateau is home to a diverse group of Aphanius with four species already described and several awaiting description. These are among the most ancient in the genus having divereged away from a common ancestor around 20 – 24 million years ago. 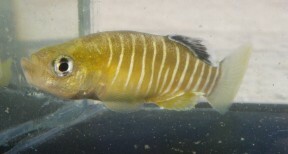 Among them this species is most closely related to A. sophiae from the Kor River system but can be distinguished by differences in patterning. Males of A. sophiae lack the characteristic dark dorsal fin colouration seen in A. vladykovi and females possess a dark, lozenge-shaped spot at the caudal peduncle which is absent in those of vladykovi. Aphanius vladykovi, a new species of tooth-carp from the Zagros Mountains of Iran (Osteichthyes: Cyprinodontidae). Contribution to the biology of Zagros tooth-carp, Aphanius vladykovi (Cyprinodontidae) in Central Iran.